There were many interesting games last round. The round ended with defeat of the leader, favorites losing the games and games ending by tiny margin. Here is the last round review presented by ESL. Top ranked San Lorenzo (22-3) recorded its third loss in Comodoro Rivadavia on Thursday night. Visitors were rolled over by fifth ranked Gimnasia (18-11) 91-71. Center Diego Romero (206-82, college: FSU) fired 14 points, 8 rebounds and 6 assists for the winners. American-Venezuelan swingman Dwight Lewis (197-87, college: USC) chipped in 21 points. American guard Donald Sims (185-87, college: Appalachian St., agency: Pensack Sports) produced 14 points for lost side. Gimnasia moved-up to fourth place. Defending champion San Lorenzo still keeps top position with three games lost. Gimnasia are looking forward to face Olimpico de La Banda (#13) at home in the next round and are hoping to win another game. San Lorenzo will play against La Union (#12) and is hoping to win this game. Very important is a road loss of second ranked Ferro (18-12) against fourteenth ranked Hispano Am. (11-15) on Wednesday night. Visiting Ferro was defeated by Hispano Am. in Rio Gallegos 90-73. It ended at the same time the three-game winning streak of Ferro. Worth to mention a great performance of American power forward Devon Scott (206-94, college: Philander Smith) who helped to win the game recording a double-double by scoring 16 points and 10 rebounds. Fernando Podesta contributed with 22 points and 5 rebounds (on 8-of-10 shooting from the field) for the winners. American power forward Charles Mitchell (203-93, college: Georgia Tech, agency: Slash Sports) replied with 21 points and 7 rebounds for Ferro. Hispano Am. maintains fourteenth position with 11-15 record. Ferro at the other side dropped to the fifth place with 12 games lost. Hispano Am. will have a break next round, and it should allow them to practice more before next game. Ferro will play on the road against the league's second-placed Regatas Corrientes (#2) having rather not much hope for a victory. Bottom-ranked Atenas managed to get a eighth victory on Thursday night. This time they won against twelfth-ranked San Martin Corrientes 96-91. Worth to mention a great performance of Walter Herrmann who helped to win the game recording 28 points. Atenas' coach Nicolas Casalanguida used a ten-player rotation in such tough game. At the losing side Lucas Faggiano responded with 24 points and 7 assists. Atenas (8-20) moved-up to nineteenth place. Loser San Martin Corrientes dropped to the eleventh position with 15 games lost. They share it with La Union. Atenas will meet at home higher ranked Penarol (#16) in the next round and it may be quite challenging game. San Martin Corrientes will have a break next round. Leader San Lorenzo delivered the twenty second victory. This time they crushed 11th ranked Olimpico de La Banda (13-16) 102-74 in Almagra. The winners were led by Marcos Mata who scored that evening 10 points and 6 assists. The winner was already known earlier in the game, so both coaches allowed to play the bench players saving starting five for next games. Defending champion maintains first position with 22-3 record. Olimpico de La Banda at the other side dropped to the thirteenth place with 16 games lost. San Lorenzo's next round opponent will be La Union (#12) in Formosa which should be another easy win for them. Olimpico de La Banda will play on the road against Gimnasia in Comodoro Rivadavia and hope to win that game. Important game to mention about took place in Sunchales. Sixteenth ranked Penarol (9-20) saved a 2-point victory on the road edging 17th ranked Libertad Sunchales (9-20) 81-79 in the fight for the sixteenth place. Juan-Pablo Vaulet fired 14 points and 6 rebounds for the winners. Penarol's coach Leonardo Gutierrez allowed to play the deep bench players in such tough game. Penarol maintains sixteenth position with 9-20 record, which they share with Libertad S. and Quilmes MP. Penarol will face higher ranked Instituto (#6) in Cordoba in the next round and they do not belong to the favorites in that game. Quimsa was defeated by Boca Jrs in Buenos Aires 94-85. Boca Jrs was beaten by La Union at home 84-90. Quilmes MP was destroyed by Estudiantes C. on the opponent's court 99-75. Hispano Am. unfortunately lost to Quimsa in a home game 79-82. Bahia Basket recorded a loss to La Union on the road 78-88. Libertad S. defeated Quilmes MP on its own court 92-84. Olimpico LB was beaten by Obras Basket in Buenos Aires 76-71. Regatas C. won against Bahia Basket at home 74-56. Bahia Basket was outscored by San Martin C. on the opponent's court 66-40. The best stats of 28th round was 16 points by Michael Hicks of San Martin C.. There was a minor upset in Buenos Aires where 7th ranked Quimsa (16-13) was defeated by tenth ranked Boca Juniors (14-14) 94-85 on Wednesday. Boca Juniors looked well-organized offensively handing out 23 assists. Quimsa was plagued by 24 personal fouls down the stretch. Cuban power forward Jasiel Rivero (204-93, agency: Pro Sports) fired 35 points (!!!) and 5 rebounds for the winners. The former international forward Matias Sandes (201-84) chipped in a double-double by scoring 11 points, 10 rebounds and 7 assists. Four Boca Juniors players scored in double figures. The former international point guard Juan Brussino (185-91) produced 31 points and the former international Leonel Schattmann (193-87) added 10 points and 6 assists respectively for lost side. Quimsa's coach Silvio Jose Santander rotated eleven players in this game, but that didn't help. Boca Juniors maintains tenth position with 14-14 record. Quimsa lost third consecutive game. They keep the seventh place with 13 games lost. Both teams do not play next round, which will be an opportunity for some rest. There was a small surprise in Buenos Aires where thirteenth ranked La Union (14-15) defeated 10th ranked Boca Juniors (14-14) 90-84 on Saturday. La Union made 18-of-22 free shots (81.8 percent) during the game. Naturalized Spanish guard Jonathan Maldonado (188-90) fired 21 points, 5 rebounds and 7 assists for the winners. The former international swingman Alexis Elsener (196-88, agency: Interperformances) chipped in a double-double by scoring 11 points and 14 rebounds. Elsener is a former Eurobasket Summer League player, which is considered top international summer league in the market. Five La Union players scored in double figures. The former international swingman Adrian Boccia (195-82) produced a double-double by scoring 14 points, 9 rebounds and 10 assists and Cuban power forward Jasiel Rivero (204-93, agency: Pro Sports) added 25 points and 8 rebounds respectively for lost side. La Union moved-up to eleventh place, which they share with San Martin C. Loser Boca Juniors keeps the tenth position with 14 games lost. La Union will face league's leader San Lorenzo in Almagra in the next round and they do not belong to the favorites in that game. Leader San Lorenzo delivered the twenty second victory. This time they crushed 11th ranked Olimpico de La Banda (13-16) 102-74 in Almagra. San Lorenzo made 24-of-28 charity shots (85.7 percent) during the game. They also forced 19 Olimpico de La Banda turnovers. San Lorenzo players were unselfish on offense dishing 21 assists. The winners were led by the former international Marcos Mata (201-86) who scored that evening 10 points and 6 assists and American center Jerome Meyinsse (207-88, college: Virginia) supported him with 14 points. Even 15 points by Dominican guard Gelvis Solano (185-94, college: Merrimack) did not help to save the game for Olimpico de La Banda. Alejandro Diez (201-87) added 12 points and 5 rebounds for lost side. The winner was already known earlier in the game, so both coaches allowed to play the bench players saving starting five for next games. Defending champion maintains first position with 22-3 record. Olimpico de La Banda at the other side dropped to the thirteenth place with 16 games lost. San Lorenzo's next round opponent will be La Union (#12) in Formosa which should be another easy win for them. Olimpico de La Banda will play on the road against Gimnasia in Comodoro Rivadavia and hope to win that game. Very expected game in Concordia where 17th ranked Quilmes MP (9-20) was rolled over by eighth ranked Estudiantes C. (16-13) 99-75 on Friday. Estudiantes C. made 22-of-29 free shots (75.9 percent) during the game. Quilmes MP was plagued by 24 personal fouls down the stretch. American forward Daviyon Draper (201-94, college: FIU) fired 21 points and 5 rebounds for the winners. Power forward Gonzalo Torres (202-94) chipped in 13 points and 9 rebounds. Four Estudiantes C. players scored in double figures. American forward Rick Jackson (206-89, college: Syracuse) produced 17 points and 5 rebounds (on 7-of-8 shooting from the field) and Mateo Bolivar (187-92) added 14 points and 5 rebounds respectively for lost side. Since the result was very predictable, it gave the chance for the coaches to test many bench players which allowed the starters a little rest for the next games. Estudiantes C. moved-up to seventh place, which they share with Quimsa. Quilmes MP lost third consecutive game. They dropped to the sixteenth position with 20 games lost. Estudiantes C. will have a break next round. Quilmes MP will play on the road against Comunicaciones (#9) in Mercedes and hope to win that game. Top ranked San Lorenzo (22-3) recorded its third loss in Comodoro Rivadavia on Thursday night. Visitors were rolled over by fifth ranked Gimnasia (18-11) 91-71. Center Diego Romero (206-82, college: FSU) fired 14 points, 8 rebounds and 6 assists for the winners. American-Venezuelan swingman Dwight Lewis (197-87, college: USC) chipped in 21 points. Five Gimnasia players scored in double figures. American guard Donald Sims (185-87, college: Appalachian St., agency: Pensack Sports) produced 14 points and Uruguayan power forward Mathias Calfani (204-92, agency: Pro Sports) added 12 points respectively for lost side. Gimnasia moved-up to fourth place. Defending champion San Lorenzo still keeps top position with three games lost. Gimnasia are looking forward to face Olimpico de La Banda (#13) at home in the next round and are hoping to win another game. San Lorenzo will play against La Union (#12) and is hoping to win this game. Very important is a road loss of second ranked Ferro (18-12) against fourteenth ranked Hispano Am. (11-15) on Wednesday night. Visiting Ferro was defeated by Hispano Am. in Rio Gallegos 90-73. It ended at the same time the three-game winning streak of Ferro. Hispano Am. players were unselfish on offense dishing 22 assists comparing to just 8 passes made by Ferro's players. Worth to mention a great performance of American power forward Devon Scott (206-94, college: Philander Smith) who helped to win the game recording a double-double by scoring 16 points and 10 rebounds. Center Fernando Podesta (205-92) contributed with 22 points and 5 rebounds (on 8-of-10 shooting from the field) for the winners. Four Hispano Am. players scored in double figures. American power forward Charles Mitchell (203-93, college: Georgia Tech, agency: Slash Sports) replied with 21 points and 7 rebounds and point guard Tomas Spano (184-98) added 13 points and 4 assists in the effort for Ferro. Hispano Am. maintains fourteenth position with 11-15 record. Ferro at the other side dropped to the fifth place with 12 games lost. Hispano Am. will have a break next round, and it should allow them to practice more before next game. Ferro will play on the road against the league's second-placed Regatas Corrientes (#2) having rather not much hope for a victory. Very predictable result in Rio Gallegos where seventh ranked Quimsa (16-13) edged 14th ranked Hispano Am. (11-15) 82-79 on Friday. Quimsa made 21-of-26 free shots (80.8 percent) during the game. Hispano Am. was plagued by 26 personal fouls down the stretch. The former international Leonel Schattmann (193-87) fired a double-double by scoring 21 points, 10 rebounds and 8 assists (made all of his nine free throws !!!) for the winners. The former international point guard Juan Brussino (185-91) chipped in 18 points, 6 assists and 5 steals. Five Quimsa players scored in double figures. Forward Patricio Tabarez (195-91) produced 31 points, 6 rebounds and 5 assists and American power forward Devon Scott (206-94, college: Philander Smith) added 20 points, 7 rebounds and 6 assists respectively for lost side. Quimsa maintains seventh position with 16-13 record, which they share with Estudiantes C. Loser Hispano Am. keeps the fourteenth place with 15 games lost. Both teams do not play next round, which will be an opportunity for some rest. Not a big story in a game in Formosa where 15th ranked Bahia Basket (11-18) was defeated by thirteenth ranked La Union (14-15) 88-78 on Wednesday. La Union made 20-of-26 free shots (76.9 percent) during the game. Bahia Basket was plagued by 26 personal fouls down the stretch. Naturalized Spanish guard Jonathan Maldonado (188-90) fired 24 points for the winners. American forward Keith Wright (203-89, college: Harvard) chipped in 18 points and 8 rebounds (on 7-of-8 shooting from the field). American center Anthony-Laveal Johnson (203-88, college: Fairfield) produced 15 points and 6 rebounds and his fellow American import forward Patrick Sanders (201-85, college: UC Irvine) added 11 points and 6 rebounds respectively for lost side. Both teams had four players each who scored in double figures. Bahia Basket's coach Sebastian Ginobili rotated eleven players in this game, but that didn't help. La Union moved-up to eleventh place, which they share with San Martin C. Bahia Basket lost third consecutive game. They keep the fifteenth position with 18 games lost. La Union will face league's leader San Lorenzo in Almagra in the next round and they do not belong to the favorites in that game. There was a small surprise when seventeenth ranked Libertad Sunchales (9-20) won against at home their close opponent Quilmes MP (9-20) 92-84 on Wednesday. Libertad Sunchales looked well-organized offensively handing out 22 assists. Guard Nicolas Copello (194-92) fired 20 points, 5 rebounds and 9 assists for the winners. International center Agustin Caffaro (206-95) chipped in 14 points and 9 rebounds. Five Libertad Sunchales players scored in double figures. Guard Lucas Ortiz (190-87) produced 31 points, 6 rebounds and 6 assists and American guard Winsome Frazier (193-82, college: Mississippi St., agency: Interperformances) added 25 points and 6 rebounds (made all of his seven free throws) respectively for lost side. Libertad Sunchales moved-up to sixteenth place, which they share with Penarol and Quilmes MP. Quilmes MP lost third consecutive game. Libertad Sunchales will face higher ranked Instituto (#6) in Cordoba in the next round and they do not belong to the favorites in that game. Important game to mention about took place in Sunchales. Sixteenth ranked Penarol (9-20) saved a 2-point victory on the road edging 17th ranked Libertad Sunchales (9-20) 81-79 in the fight for the sixteenth place. International Juan-Pablo Vaulet (198-96, agency: Interperformances) fired 14 points and 6 rebounds for the winners. Naturalized Italian center Damian Tintorelli (204-81) chipped in 15 points and 5 rebounds. Penarol's coach Leonardo Gutierrez allowed to play the deep bench players in such tough game. The former international Erik Thomas (196-95, college: New Orleans) produced a double-double by scoring 15 points and 12 rebounds and Martin Cuello (193-93) added 17 points respectively for lost side. Four Penarol and five Libertad Sunchales players scored in double figures. Penarol maintains sixteenth position with 9-20 record, which they share with Libertad S. and Quilmes MP. Penarol will face higher ranked Instituto (#6) in Cordoba in the next round and they do not belong to the favorites in that game. There was no surprise in Buenos Aires where 11th ranked Olimpico de La Banda (13-16) was defeated by fourth ranked Obras Basket (18-10) 76-71 on Thursday. However just five-point win is not that big difference and the fans of host team counted on more convincing victory. Obras Basket outrebounded Olimpico de La Banda 42-30 including 17 on the offensive glass. American power forward Eric Anderson (204-93, college: New Haven, agency: Duran International) fired a double-double by scoring 16 points and 11 rebounds for the winners. The other American import point guard Dion Dixon (191-89, college: Cincinnati, agency: Duran International) chipped in 15 points. American-North Macedonian Jeremiah Massey (202-82, college: Kansas St.) produced 22 points and point guard Jonatan Machuca (182-89) added 11 points and 6 assists respectively for lost side. Both coaches used bench players in such tough game. Obras Basket moved-up to third place. Loser Olimpico de La Banda dropped to the thirteenth position with 16 games lost. Obras Basket will face bottom-ranked Argentino (#20) in Junin in the next round which should be an easy win for them. Olimpico de La Banda will play on the road against Gimnasia (#4) in Comodoro Rivadavia and hope to win that game. No shocking result in a game when third ranked Regatas Corrientes (19-11) defeated at home 15th ranked Bahia Basket (11-18) 74-56 on Friday. American swingman Anthony Smith (196-86, college: Liberty) fired 7 points, 9 rebounds and 4 assists for the winners. American-Dominican guard Adonys Henriquez (198-94, college: St.Louis) chipped in 15 points. Point guard Facundo Corvalan (190-98) produced 17 points and swingman Martin Fernandez (193-97) added 10 points respectively for lost side. Both coaches used bench players which allowed the starters a little rest for the next games. Regatas Corrientes moved-up to second place. Bahia Basket lost third consecutive game. They keep the fifteenth position with 18 games lost. Regatas Corrientes will face Ferro (#5) in Buenos Aires in the next round. Bottom-ranked Atenas managed to get a eighth victory on Thursday night. This time they won against twelfth-ranked San Martin Corrientes 96-91. Worth to mention a great performance of the former international forward Walter Herrmann (206-79) who helped to win the game recording 28 points and American swingman JJ Moore (198-91, college: Rutgers) who added 20 points during the contest. Atenas' coach Nicolas Casalanguida used a ten-player rotation in such tough game. At the losing side international point guard Lucas Faggiano (188-89, college: LIU Brooklyn) responded with 24 points and 7 assists and American power forward Lee Roberts (201-87, college: Findlay, OH) scored 14 points and 7 rebounds. Four San Martin Corrientes players scored in double figures. Atenas (8-20) moved-up to nineteenth place. Loser San Martin Corrientes dropped to the eleventh position with 15 games lost. They share it with La Union. Atenas will meet at home higher ranked Penarol (#16) in the next round and it may be quite challenging game. San Martin Corrientes will have a break next round. Rather expected game when 15th ranked Bahia Basket (11-18) was rolled over on the road by twelfth ranked San Martin Corrientes (14-15) 66-40 on Saturday. 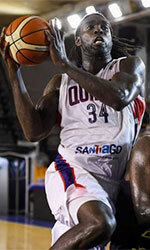 Panamanian forward Michael Hicks (196-76, college: Texas A&M-CC) fired 16 points for the winners. American power forward Lee Roberts (201-87, college: Findlay, OH) chipped in 6 points and 13 rebounds. Panamanian-Chilean guard Eugenio Luzcando (190-95, college: Idaho St.) produced 4 points and 6 rebounds and Federico Elias (188-99) added 6 points respectively for lost side. Since the result was very predictable, it gave the chance for the coaches to test many bench players which allowed the starters a little rest for the next games. San Martin Corrientes moved-up to eleventh place, which they share with La Union. Bahia Basket lost third consecutive game. They keep the fifteenth position with 18 games lost. Both teams do not play next round, which will be an opportunity for some rest.